It is another one of those heartfelt, emotional-invoking anime films that seem to captivate our very soul into such a wonderful story. It mixes a modern setting with parallel worlds and fantasy. In an alternate timeline, Japan was divided after losing World War II: Hokkaido was annexed by "Union" while Honshu and other southern islands were under US sovereignty. A gigantic yet mysterious tower was constructed at Hokkaido and could be seen clearly from Aomori (the northernmost prefecture of Honshu) across Tsugaru Strait. In the summer of 1996, three 9th-graders had made a promise that one day they'll build an aircraft and unravel the tower's mystery, but their project was abandoned after the girl, Sayuri Sawatari, began experiencing sleeping sickness and transferred to Tokyo for better treatment. Three years later, Hiroki Fujisawa accidentally found out that Sayuri had been in a coma since then, and he asked Takuya Shirakawa to help him finding a way to revive her. What they don't know yet is that Sayuri's unconsciousness is somehow linked with secrets of the tower and the world. Whether it was because of the wonderful artwork that this anime produced or it was because of the inner connections with the characters you had, The Place Promised in Our Early Days is a wonderfully piece of art that should be recommended to everyone to watch. The story is set in an alternate timeline where Japan is divided into two, the Union and the US sovereignty. A mysterious gigantic tower was constructed in the southern part of Japan and nobody knows that it's true purpose is. In the summer of 1996, three 9th grade students decide to construct a plane and travel to the tower. However, one of the members, Sayuri Sawatari begins to experience sleeping sickness and is then transferred to Tokyo for better treatment. Three years alter, we see that Sayuri has been in a coma since that day which sparks interest by Hiroki and Takuya to find a way to help her and unravel the mystery of the tower. In a way, the story does contain plenty of fictitious elements that do entertain such as parallel (or dream) worlds, symbolic meanings, and psycological contact in a figurative state. The sci-fi side of things is quite ambiguous and the anime does to explain any further about the whole parallel world stuff, but the story was enjoyable nonetheless. The art was simply stunning, amazingly illustrated and instantly captured my attention. I noted that the art style used on plenty of scenes felt like it was painted using water colors (if you noticed the clouds). Anyhow, each scenes was wonderfully animated and everything felt alive. The characters definitely looked great and the use of lighting in this anime was really detailed. The voice acting was really good as well. The theme songs were also quite emotional and invoked feeling through the imagery used in the anime. I must note that the sound quality was well done throughout the film. The background music was the masterpiece of this anime. It reflected the mood and feeling of the anime accurately. It was enjoyable listening to the music throughout the film. There is nothing really special about the main characters. You can say that they're normal. But perhaps thats the appeal of it. Watching these kids grow and become more resolve is an enriching experience. There is nothing special about the supporting characters as well. In the end, it was one of those emotional films that you probably can only watch once to feel all your emotional pour out. It was a well compiled film from start to finish. The sense of loneliness and accomplishment is felt throughout each scene and can be reflected in other films such as Voices of a Distant Star and 5 Centimeters per Second. It was a nice fantasy story about a mysterious tower that is linked to a person. Also, if you like these type of anime, this will surely entertain you. It was simply wonderful to watch. Everything was perfect for this anime. The voice acting was pretty good, but the background music was what made the anime felt alive. The characters seemed pretty normal and average, but that is probably what the anime was intended to portray. I felt emotional, moved to tears, and just simply stunned at the brilliance of the artwork in this anime film. 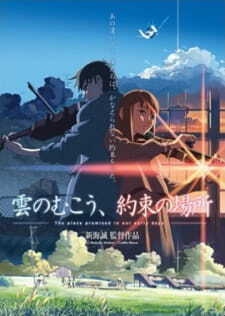 Definitely a must-watch for those who like mysterious, melancholy anime.